The letter "L" appears poised to take over the blog in the next several days because, for one thing, I plan to post some old letters from the late Coral Lorenzen of APRO (see my tribute to her way earlier in blog entries). However, I also want to bring two more "L's" to your attention now. The first is Lesley, whose popular blog, The Debris Field is widely read and offers readers a daily list of links to UFO-related and other articles and web sites of interest. Her links are timely and informative, a contemporary mix leading us to the weird, the conventional and the weirdly conventional. Not to exclude, of course, that Lesley kindly includes a link to this blog, new though it is, when she feels I've something of potential interest for her readers. Lesley's daily blog, placing a potpourri of the unusual before your eyes, may be found at thedebrisfield.blogspot.com. Thanks Lesley. Also. . .
L also stands for Lucius, as in Lucius Farish, a UFO writer and researcher for decades. Lou also hosts the annual Ozark UFO conference which attracts many speakers of note. 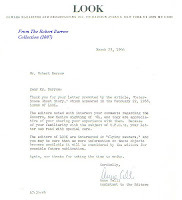 I've corresponded with him since, if memory serves, the late seventies, when he formerly wrote a column entitled, "In Others' Words" for The MUFON UFO Journal. Lucius is extremely knowledgeable about UFO history and has written numerous articles over the years for various publications. As long as I've known him, Lucius has also published the monthly UFONS (UFO News Service) compilation, a collection of UFO-related news clippings from around the world. If you wish to subscribe to this fine publication or find further details about UFONS and the annual Ozark conference, please go to http://www.ozarkufo.com/ufons.htm You can also write Lucius Farish directly via e-mail at ufons@webtv.net Thanks, Lou, for being a fund of knowledge. You may recall that on November 7 last year a possible UFO hovering for several minutes over Chicago's O'Hare Airport was observed by multiple witnesses, only to depart suddenly and dramatically upward, apparently punching a hole in the clouds overhead. 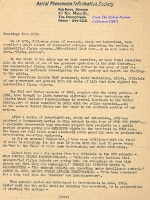 The Chicago Tribune and National UFO Reporting Center intrigued public interest by revealing facts known at the time. "We postulate that the instantaneous nature of the HIC (hole in clouds -- r.b.) formation, the circular shape, and its sharp edges all point to the direct emission of, for example, electromagnetic radiation from the surface of the oblate spheroid as the proximate cause of the HIC. We cannot identify the object or phenomenon lying inside the oblate spheroid surface, but two conclusions seem inescapable: 1) the object or phenomenon observed would have to have been something objectively and externally real to create the HIC effect; and, 2) the HIC phenomenon associated with this object cannot be explained by either conventional weather phenomena or conventional aerospace craft, whether acknowledged or unacknowledged." * We must keep in mind that NARCAP's primary concern is to establish whether UAP represent a safety hazard to flight personnel and passengers. In the O'Hare case, the predominant opinion clearly sites a danger precipitated by the well-witnessed UAP. Have you ever wondered, even for a moment, why UFO researchers in recent years have had access to many thousands of previously classified government pages regarding UFOs? True, a good share of them arrive with significant portions of information redacted or blacked out, but in many ways it's a miracle we have access to anything at all. That "miracle" came about only one way. After months of effort, the U.S. Congress finally put the finishing touches on the "Freedom of Information Act," otherwise known as Public Law 89-487, and it went into effect with great and well-deserved fanfare, appropriately, on July 4, 1966 -- truly an "independence day" for previously hidden government data of all sorts. Today I'm posting the original law itself, as well as two letters in reference to the law and my concerns over its possible effects on government UFO-related documents. Though I'd not seen any of these papers for decades, I nonetheless felt a tingle once I happened upon them because these are the real deal, representative of a spectacular moment of historical significance that continues to reverberate throughout the land and, we hope, projects a government openness that lasts forever. True, circumstances in recent years have curbed the law's abilities severely, but its meaning lives on so that journalists, common folk -- and UFO researchers -- have at our fingertips in the future the power to both know the previously unknowable and to find that which otherwise might have been lost forever. 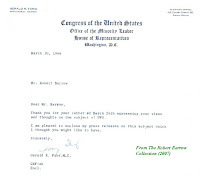 I didn't remember communicating so frequently with Gerald Ford's office when he was House minority leader in the sixties, but the letters continue to show up. I'll post a couple more today, and there may yet be others in the weeks ahead. By now, I'm sure some of my readers are rolling their eyes over my apparent infatuation with Gerald Ford, but his importance to UFO research history is truly undeniable. 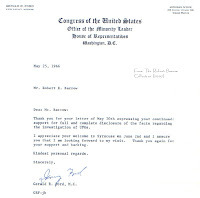 Ford's May 25, 1966 letter is pretty routine as he thanks me for my interest in a UFO investigation, and apparently he was about to visit Central New York, acknowledging some words of welcome. 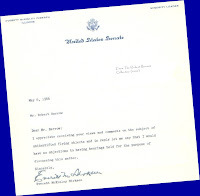 A week earlier his office prepared the May 17 letter. 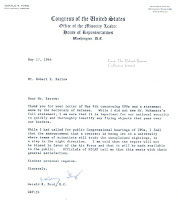 This one responded to my letter of May 9, in which I brought up comments about UFOs made by then Secretary of Defense Robert S. McNamara during closed congressional meetings regarding a foreign aid bill. I quoted and took to task McNamara, certainly known more for his actions during the Vietnam conflict than for UFO statements, for commenting, "If anything, I am inclined to think the (UFO) investigations are more extensive than actually required." He went on to say the government did not place "any real credence in the reports we have received to date," though he added the caveat, "That doesn't mean that a full report tomorrow may not be sound and warrant the full investigation that we give it." My concern in the letter to Ford was, if the Secretary of Defense believed that UFO investigation efforts should be trimmed and given a back seat treatment, wasn't there a high probability that something essential might be missed in future investigations? UFO photos, McNamara continued, are illusory: "The condition of the viewer and the physical circumstances in the environment at the time generally create optical illusions." I expressed to Ford some curiosity that intelligence photos taken in Southeast Asia by military personnel of a caliber similar to many UFO photographers might also, therefore, be considered highly suspect. 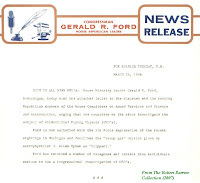 On a similar note, as my letter to Gerald Ford neared its conclusion, I asked why, if UFO photos were nonsense, had the Air Force not yet returned pictures it borrowed for analysis (promising a full report) from Ohio police officers who chased a UFO for one and a half hours a few weeks previously? Ford volunteered no answers, but at this stage he merely seemed pleased that Colorado University was about to undertake a UFO study, and was even aware of the organization NICAP's views on, as Shakespeare might call it, this star-crossed UFO project -- a project whose conclusions, despite the negative "findings," actually documented enough evidence to suggest UFOs still represent a real scientific mystery. Like Congressman Gerald Ford, House minority leader in the mid-sixties, Illinois Senator Everett Dirksen was minority leader, too, for the U.S. Senate. 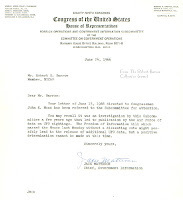 No, his letter shown here offers nothing shocking, just his honest statement that he would harbor no objections to Congressional hearings on the UFO subject. I wanted to give Dirksen, who served until a ripe old age, some space here because he was the epitome of integrity and reflected the best the Senate had to offer. A Dirksen high point was his voice, and if you've never heard him speak you really should find an old recording and listen closely to the voice that reasoned clearly and soothed almost hypnotically. In fact, Dirksen's gift of voice was hardly lost on the man, because sometime around 1967 an LP album appeared in stores entitled "Gallant Men," stories of America's beginnings, with selections patriotically narrated by Dirksen and effectively backed up by an orchestra. Five years later, shortly before my discharge from the Air Force, my final roommate Dave, a young airman from the Midwest, and I were shopping off base at some variety store when I happened upon a sealed, new copy in the discontinued LP bin. Since I never had the LP, finding it was priceless, so I grabbed it and headed toward checkout. Unfortunately, Dave decided he wanted it, too, and gave me some hard-luck story about how his dad loved Senator Dirksen and would be so proud and pleased to have the LP. Did I, you may wonder, now burdened with guilt at the prospect of depriving Mr. Dave Sr. of this prized recording, reach down into the depths of kindness in my soul and bestow it, as if a gift of gold, to Airman Dave? No, heck no. Instead, I taught Dave a duo of lessons that day. First lesson -- as The Rolling Stones taught us, you can't always get what you want. Second lesson -- I was the one with the car who drove us there, and if I had to leave the parking lot alone, it would just be too darned bad. The album still reposes around my home somewhere, decades later. I might even consider trading it in exchange for another Senator Everett McKinley Dirksen -- and maybe another Senator Barry Goldwater -- to occupy the U.S. Senate today. At least these gentlemen of Congress answered honestly and forthrightly when the public brought the UFO issue before them. Newspaper letters to the editor can sometimes be effective in swaying or reinforcing public opinion, and by 1966 I certainly discovered a great deal of reader interest in UFOs through my frequent letters intended to inform. Displayed here is a letter from the editor of The Post-Standard (Syracuse, NY), making reference to both this subject and an interesting enclosure. 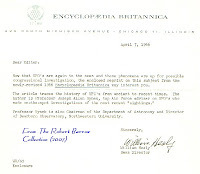 Obviously, the public relations personnel at The Encyclopedia Britannica keenly realized the UFO subject's intrigue, especially in 1966 when the Michigan UFO sightings initiated news headlines all over the world. From its 1966 encyclopedia set, Britannica photocopied the section on UFOs written at some point by Dr. J. Allen Hynek and apparently mailed them to news editors all over the U.S.
Hynek's contribution, perhaps written sometime in 1965, or even 1964, showcases a scientist with an open mind about UFOs, but still far from ready to exhibit his eventual publicly announced belief that UFOs are a profound scientific mystery worthy of his Center for UFO Studies and books on their importance. His reluctance is hinted as the article concludes with a reference to a lack of trained observers -- though Hynek must have been aware more than anybody that trained observers of UFOs existed in large numbers via his own investigations. One suspects, of course, that his Air Force affiliation kept him somewhat self-muzzled as he simultaneously experienced a personal war of the intellect, precipitated particularly by his encounter with physical evidence and a sober tale of occupants at Socorro, NM (1964). By the time the Michigan UFO furor, Barney and Betty Hill's abduction account and other events began saturating Dr. Hynek's thoughts, it would be reasonable to expect that Hynek himself would have deleted much of the 1966 Encyclopedia Britannica article to write something far more dramatic and troubling to science -- and that would have been a very, very good thing. 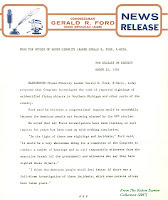 The 1966 UFO sightings over Michigan and other parts of the U.S. caused an anxious public to demand Congressional action, and no government official seemed more determined to get to the bottom of things than Rep.Gerald Ford, whose Michigan constituents were particularly vocal about events in the state. The future President Ford's actions eventually led to Congressional hearings and, ultimately, the infamous University of Colorado UFO study. Under the direction of Dr. Edward U. Condon, the project, as mentioned previously, declared UFOs unreal -- exactly as predicted by Look Magazine and author John G. Fuller, who exposed the project as essentially a diversion intent upon reaching a negative conclusion about UFOs, evidence to the contrary be damned. I wrote Dr. Condon when the project began, energized and hopeful that at last a truly scientific inquiry was underway. Condon replied with a brief letter, and I'll post that just for old times' sake when I find it. In the meantime, here's more Gerald Ford UFO history. (Please refer way back to my blog entry of June 11, 2007 where I posted Ford's response to indications of dishonesty in the Colorado study.) This time, I offer a letter from Ford plus enclosures of two news releases (I love those illustrations) and a copy of his letter to two powerful government figures requesting action. 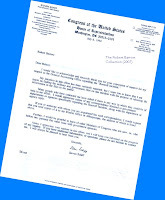 I'm rather amused that one of the Ford letter's recipients is no less than L. Mendel Rivers, chief of the House Armed Services Committee -- who (see a previous post for his letter) less than a year before had flipped off my own UFO concerns in a letter to my congressman. This time, Rivers didn't have the choice to denounce UFOs and people inquiring about them. Congressman Gerald Ford, House minority leader, was knocking at Rivers' door, and he meant business. If UFO-tinged nostalgia is your thing, you've come to the right place. I'm in the process of unearthing files even I haven't seen in years, and it really is my intention to post scans of interest. Currently, I'm digging through 1966 and this year will occupy us for a while. 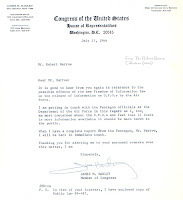 I've located several more things from the late President Gerald Ford when he was still a Michigan congressman, pertaining, of course, to the Michigan UFO sightings and his concern for a UFO inquiry. But today I'm posting a letter from Look Magazine, received in March of 1966. The February 22 issue of Look, another beloved American periodical gone to the great magazine heaven in the sky, had shaken the country with John G. Fuller's article, "Outer Space Ghost Story," his account of UFO close encounters in Exeter, NH. The same year, Fuller's story became a best-selling book entitled Incident at Exeter, a work we've mentioned a couple of times previously here. I wrote Look about the piece and related my interest in the Socorro, NM UFO incident of April, 1964, and I suppose I asked the editors to run more about that subject in the future, too. You see, one of my dirty little secrets is that I've long been more intrigued by the Socorro case than the Roswell UFO furor. Call me misinformed, call me a fool, call me stupid because I'm waiting for the wrong train to pass by -- can't help it, that's just the way I've felt and am perfectly content to let those far more familiar with Roswell pursue the facts (and, I will admit, the Roswell story is a crackling hot fire right now, so go for it). An editorial staff member kindly took a moment to reply in the letter shown here. How I yearn for those days again, a time when a letter to a company warranted an actual typed, personal, one-of-a-kind response instead of a computer-generated one-size-fits-'em-all piece of electronic blather. I will say this much. Ms. Celli wasn't kidding around when she said that the editors of Look were interested in "flying saucers" and would pursue the subject in the future: On May 14, 1968 Look and author John G. Fuller again shook the nation with the story, "Flying Saucer Fiasco," an expose' of serious trouble in the very bowels of the University of Colorado UFO "study." The emerging scandal centered around a particular in-house memo and the revelation that, no matter the evidence, the study would focus upon issuance of a negative report regarding UFO existence. Gerald Ford was concerned (see my Ford letter posted several entries ago), NICAP was angry, the public was upset -- and Look Magazine and Fuller subsequently proved to be right-on about Colorado U. Obviously, non-existent UFO sightings, videos, photos, pilot reports and other phantasms continue to this very day. Just live with it, okay? Many radio listeners today are just young enough to believe that "Coast to Coast AM" is the most innovative program of its kind ever presented. Not true. As far back as the 1950s -- and even before that, depending upon one's definition -- there existed precursors to today's "weird radio." The most obvious to me is Long John Nebel, whose nightly broadcasts out of NY City beginning in the fifties gave his large radio audience a steady dose of UFOs and other mysteries. He routinely called upon a reliable stable of guests and took phone calls from listeners. Actually, by the time the sixties and seventies arrived, the country was sprinkled with wildly successful UFO-related shows at radio stations, usually on a smaller scale. Wendy Connors (see the link for Faded Discs on the right), in fact, has taken a number of tape recordings of these old programs and engineered them into digital format before they disappear forever, thus assuring that inquiring minds will always know who the true pioneers of UFO talk radio were: Frank Edwards, Earl J. Neff, Gene Duplantier (Canada), Lou Corbin and so many others whose names belong on the list. But "Coast to Coast AM?" Just a Johnny, oops, I mean just an "Art-Come-Lately." From my files, here's something from 1966. For a time, Bob Barry of Pennsylvania -- who, I'm not sure, but may be the same Robert Barry (deceased) unfortunately implicated in some tall tales of the UFO variety in the sixties, not at all to his credit -- offered tape-recorded UFO programs to U.S. radio stations for free. The only requirement was that the stations had to supply their own reel-to-reel tapes and pay the outrageous (!) postal costs of 10 to 15 cents for shipping. 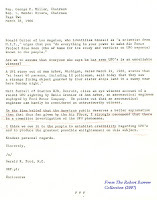 In return, he advertised his UFO organization during each episode of "The UFO Story" and listeners could contact him. As you can see in his list, a number of stations dotting the nation picked up the program because the UFO subject was then, as now, an incredible draw for listeners. Again, look at "Coast to Coast AM," winner of broadcast awards and a hit with listeners all over the world. However, on the other hand, I remain clueless to understand why so many station managers and program directors continue to avoid carrying even locally originated shows about UFOs and other topics of the unusual to this day, especially when it's a proven fact that listeners accumulate and sponsors are available. When I guested on numerous radio and TV programs throughout the sixties and seventies to discuss UFOs, audience response was always great. But when I approached the same stations to suggest doing a regular program, oh no, they just wouldn't, that "just won't fly." When will they ever learn? New Mexico Congressman Steven Schiff died much too young as a victim of skin cancer in 1998, but he left an official legacy of sorts as a champion of people who demanded information about the 1947 Roswell UFO incident. Because Roswell is "big stuff" again with the release of a new book and the quickly infamous "Walter G.Haut affidavit," we really should take a moment to remember Schiff's brief, yet important, contribution to the investigation. Schiff aggressively attempted to learn the facts about Roswell via official channels such as the General Accounting Office, but repeatedly met "stone walls" and accounts of Roswell documentation having been systematically destroyed years ago. 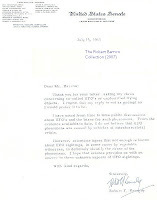 A letter I received from his office in 1994, shown here (click on it to enlarge), demonstrates his passion to obtain information from any and all potential sources. Congressional members willing to actively pursue UFO-related issues, especially in full view of public scrutiny, unfortunately seem far and few between currently. If only they realized what heroes they would be to all of us, should the day ever come when they resolve to stop at nothing until we, the people, have the truth to which we're entitled, as members of what once glittered briefly, and now precariously, as a free and open society. Steven Schiff -- Thank you, sir, we salute your rare memory, for you stood alone while others cowered, chuckled or pursued political goals purely of the self-help variety. 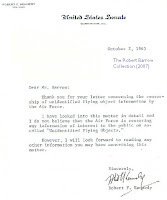 Despite what you may have read over the years, the late Senator Robert F. Kennedy was not a rabid proponent of UFOs, and I hope the three letters his office sent to me in 1965 dispel those rumors once and for all. We may now also assume with virtual certainty that a widely distributed letter supposedly sent to the late writer/publisher Gray Barker in the sixties -- with Kennedy seeming to express a deep interest in UFO reality -- is a hoax. 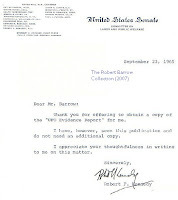 I first sent copies of my Kennedy letters to Canadian UFO researcher Grant Cameron a few years ago, where he posted them (along with the questionable Gray Barker letter, as well as another legitimate low-key RFK letter to another constituent regarding UFOs) at his web site, Presidential UFO (see link). Grant would appear to be the first Web-based researcher to expose the Barker/Kennedy letter sham for the lie it obviously is. Grant's Web site offers a detailed and unique interpretation of how various U.S. presidents approached the UFO subject, and his extensive and comprehensive research, much of it culminated from visits to various presidential libraries, is definitely worth a look You'll find a minor contribution or two from me, as well, and I thank Grant for including things from my own files on his site. If, by any chance, Robert Kennedy did harbor different UFO views, privately or professionally, public documents have apparently never demonstrated any such aspect of his thoughts. Sixty years ago. Where's a good, reliable time machine when you need one?. Numerous researchers claim an in-depth familiarity with the 1947 "Roswell incident" involving an alleged UFO crash and alien bodies, and I need to state right up front that I'm not amongst them. I only know what I read from their own reports, and indeed there have been some remarkably detailed witness accounts and other documentation offered publicly. However, I did want to comment briefly on the affidavit left behind by the late Walter Haut, as revealed prominently now in the new book, Witness to Roswell, by Tom Carey and Donald Schmitt. Last January 15 I reviewed for UFO Updates (online) a tape-recorded interview conducted in 2000 by Wendy Connors and Dennis Balthaser with Walter Haut. I was not familiar with the affidavit at that time, and my review was based solely upon what I had read in the past about Roswell, as well as events referenced by Mr. Haut himself. he's not exactly ready to spell out in depth. . ."
repeatedly in progressively pointed terms." With wide release of the affidavit, I would venture that Haut's reasons for apparently holding information back during Connors' and Balthaser's interview have become clear, and let there be no doubts now that he knew exactly what he was doing whenever he tried to select his words cautiously.